It was back in the 1920s when Alfredo di Lelio created his signature dish in Rome. We've given it a little seafood slant by adding prawns. We think the great man would approve. 1 Cook the pasta according to the pack instructions, then drain in a colander. 2 Meanwhile, heat the oil in a pan and sauté the prawns, then in a bowl, mix the mayonnaise, garlic, cheese and milk together. 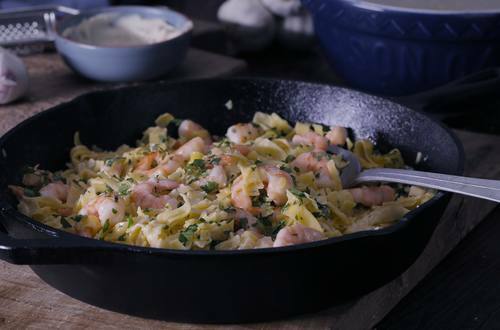 3 Turn off the heat under the pan with the prawns in, add the Alfredo sauce mixture and stir in. The residual heat of the pan will bind the sauce together without burning the cheese or making it stick to the pan. 4 Mix with the pasta and serve, then season with the parsley. Finally, raise a glass to the memory of Signore di Lelio.